Investigations into a new class of pharmacologically active drugs for improvement of physical and mental efficiency in people, called actoprotectors, were carried out under Professor Vladimir Vinogradov at the Military Medical Acad­emy (then Leningrad, USSR; now, St. Petersburg, Russia)’s Department of Pharmacology in the 1970s. This work resulted in the development of the first and most com­monly used actoprotector, bemitil (chemical structure: 2-eth­ylbenzimidazole hydrobromide; English-language literature: “bemithil”, “bemithyl” or “bemethyl”; also known as “bemactor” and “metaprot” in later publications). This achieve­ment earned Professor Vinogradov and his research group the State Prize of the USSR. 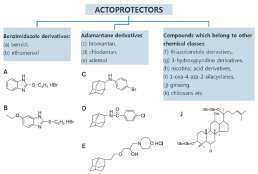 Other actoprotectors subsequently were formulated as well, the most important of which, from the practical point of view is bromantane. The first recipients of bemitil were Soviet cosmonaughts. Bemitil also was successfully employed in preparing the athletes of the USSR’s national team for the 1980 Olympic Games held in Moscow. Later, throughout the 1990s, it was used as a basic medicinal agent in almost all of the corps of the Soviet and then Russian armies. Notably, its administra­tion made it possible to increase soldiers’ endurance over long marches; in the Air Forces, Missile Troops, and Army Air Defense, it enhanced work capacity and stability to hypoxia; and in the Navy, it reinforced stability to hypoxia and, where applicable, high temperatures. The latter property, in fact, had determined its wide use by the “limited contingent” of Soviet troops in Afghanistan. Bemitil enabled soldiers, including Spe­cial Forces, to effectively perform combat missions under both hypoxic and high-temperature conditions. Bemitil’s effective­ness for various types of activities was shown also in its en­hancement of the physical and mental capacities of rescue and other workers deployed in the wakes of the Chernobyl catastrophe (1986), the earthquakes in Armenia (1988), and the railway accidents in Bashkiria (1989) (Shabanov, 2009a). Bromantane also was employed in the Soviet and Russian armies, to shorten recovery times after strong physical exer­tion, though not as widely as bemitil. After the disintegration of the USSR in 1991, the official manufacture and clinical use of bemitil was discontinued. However, owing to its wide-ranging pharmacological activity, high efficiency, and safety, its initial sports and military medi­cine applications have been extended widely to other branch­es of practical medicine. As for bromantane, its production continued after 1991, though its applications were limited, pri­marily, to sports medicine. Nowadays, bemitil is manufactured in Ukraine (commercial name: Antihot) and is widely used in preparing Ukrainian national sport teams for international competitions. Bromantane is manufactured in Russia (com­mercial name: Ladasten); since 1997, anti-doping regulations have prohibited its use in sports, though it has recently been utilized in the treatment of patients with asthenic and restless-asthenic frustration.